 Tarzan tracks down a group of men who are kidnapping native girls and discovers that the population of their city, Lyolia, is being decimated by an infectious plague. He summons the doctor from Randini but in the meantime the Lyolians kidnap both Jane and the doctor's nurse, Lola. They plan to use the captured women to repopulate their city. The prince of Lyolia is disturbed that his high priest can not cure his ailing son and has him imprisoned. Sengo, the chief kidnapper and custodian of the slave girls, makes advances towards Jane but she manages to fight him off. She and Lola seek refuge from Sengo in an old tomb but he discovers their hiding place and traps them both by having the tomb sealed. Meanwhile, Tarzan and the doctor have lost the medicine that will cure the prince's son somewhere in the jungle. Tarzan rescues Jane and Lola from the tomb and battles Sengo to the death over a lion pit. The serum is found and the doctor manages to save the prince's son and the other sick Lyolians. 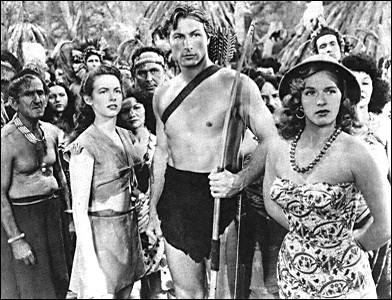 The slave girls are freed and Tarzan, Jane and Lola are bid safe passage back to their homes.